Have been bought a new radio set and as such all my corona gear is up for sale. 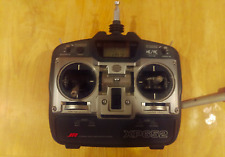 For auction is a J.R X3810 8 channel transmitter.mode 2 with battery complete with 9 channel receiver and battery although I would recommend replacing battery's.Both transmitter and receiver came with a model that was built but never flown so they are according to previous owner unused which looking at them I would agree as the model they came with has never seen fuel.A manual is also included as is a crystal in transmitter but not receiver.the battery cover is present I removed it so battery can be seen. The only problem is the elevator dual rate switch is broken from storage.top left hand corner has a small mark if being picky.uk post only.thanks. JR9X2 no battery or charger or receiver in original box. Futaba T6EX 2.4 ghz fasst six channel transmitter, I bought this transmitter as a back up but never used it to fly so is still in new condition the screen protector is still fitted. Good used condition, no broken switches etc. Case and transmitter stand. 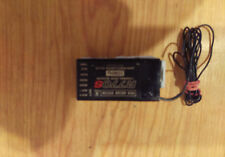 DSM/DSM2 Compatible (all Spektrum / JR 2.4Ghz receivers). Band: 2.4 Ghz. RD921 DSM2 Receiver (Included). Receiver: R921 (JRPR921). The battery cover is a little loose but still does its job. Supplied with its original PCM receiver and crystals and as you can see in the photos, the aerial is as straight as an arrow (rare). Have been bought a new radio set and as such, this transmitter and all my corona gear is up for sale. Used but in very good condition. Included in original box with manual. R G831B 8-ch DMSS 2.4GHz receiver. NEC-A912 JR 9.0V power adapter. J/R DSX9 2.4 GHZ DSM2 TRANSMITTER IN EXCELLENT CONDITION SET UP MODE 2 AND FITTED WITH A GOOD BATTERY, HAS A SCREEN PROTECTOR FITTED. THE TRANSMITTER WORKS WITH ALL MAKES OF DSM2 RECEIVERS AND MOST DSMX RECEIVERS. JR X9303 Radio SET. Condition is Used But Perfect Condition as on pictures still protector screen on from New areal antenna missing part as on pictures Dispatched with Royal Mail 2st Class. For sale is the legendary JR Apex 7 channel transmitter for planes, helicopters and gliders radio control unit. Very well looked after in immaculate condition. This is a modular radio and can be used with either 35MHz , DSM2 , DSMX and DMSS modules also making it very versatile. Can also be used with 5.8 GHz FPV modules for extended range. Comes with high quality and Precision JR gimbals for accurate control of your models. This sale includes the following: JR Apex transmitter mode 1 with 35 MHZ module Operation manual Transmitter battery not included All sales are final and UK buyers only! THIS IS THE EXCELLENT J/R DSX9 MARK TWO DSM2 2.4 GHZ TRANSMITTER, THE TRANSMITTER IS IN GOOD CONDITION AND FULL WORKING ORDER, THERE ARE A FEW SCRATCHES ON THE SCREEN GLASS BUT AS THIS IS A BACKLIT SCREEN THEY ONLY SHOW UP WHEN THE TRANSMITTER IS SWITCHED OFF. For sale is a vintage rc transmitter for collectors from the 60's. Can be converted into 2.4 ghz with engineering work or can be kept as a collector item. The unit is AM modulation and would need a new battery not included. The unit is functional but due to the latest telecom interferences may not work as reliable as a 2.4 Ghz system. Use of this system is entirely at the buyer's risk. All sales are final and UK buyers only! Other than that, all OK. No Crystal fitted. THESE RECEIVERS WERE AROUND £70 EACH,THE SALE IS FOR BOTH RECEIVERS. THESE RECEIVERS ARE FM SO CAN BE USED WITH OTHER MAKES OF TRANSMITTER, HOWEVER YOU WILL NEED TO USE THE APPROPRIATE CRYSTALS I/E IF USING A FUTABA TRANSMITTER USE FUTABA TRANSMITTER AND RECEIVER CRYSTALS. JR RS70 synthesised 35 MHz receiver. Excellent receiver from JR/MacGregor. 7 channels. J/R X388S TRANSMITTER IN REALLY NICE CONDITION SET ON MODE 2 AND FITTED WITH A GOOD BATTERY, I LOVE THESE OLDER J/R TRANSMITTERS THEY'RE SO WELL BUILT THEY WILL GO ON FOREVER. THE TRANSMITTER HAS BEEN BROUGHT RIGHT UP TO DATE BY BEING FITTED WITH A FRSKY 2.4 GHZ MODULE, THERE IS ALSO TWO FRSKY EIGHT CHANNEL RECEIVERS INCLUDED TO GET YOU GOING, THE RECEIVERS ARE BOTH BOUND TO THE MODULE SO ALL YOU NEED TO DO IS INSTALL YOUR RECEIVERS AND AWAY YOU GO. JR - JRPX03676 - XBus XB1-PC4 50mm XBus NX Servo Harness, 4 Lead. The PC4 X Bus Servo Adapter is designed for Heavy Duty applications where high current power distribution is required. THESE RECEIVERS WERE AROUND £80 TO BUY. THE TRANSMITTER WORKS WITH ALL MAKES OF DSM2 RECEIVERS AND MOST DSMX RECEIVERS. J/R X388S TRANSMITTER IN REALLY NICE CONDITION SET ON MODE 2 AND FITTED WITH A GOOD BATTERY, I LOVE THESE OLDER J/R TRANSMITTERS THEY'RE SO WELL BUILT THEY WILL GO ON FOREVER. THIS IS A VERY COMPETENT TRANSMITTER IT WILL FLY MOST THINGS THE AVERAGE FLYER WOULD EVER WANT AND VERY EASY TO PROGRAM. In good working order. It has been tried and tested prior to sale. Grab yourself a Bargain ! JR NER-326X 6 Channel FM 35Mhz Receiver. Working, very clean, no receiver crystal fitted. XB2-CHB Heavy Duty Redundant Xbus Center Hub(JRPX03687). JR - JRPX03687 - XBus XB2-CHB Heavy Duty Dual Redundant X Bus Center Hub. 3 heavy duty XBus output channels capable of driving up to 12 servos effortlessly. JR XG11 DMSS Transmitter only. Mode 2 with analogue throttle trim. Used condition, with manual. A charger can be supplied if required. For sale is the legendary JR X3810 8 channel, 3 items planes, helicopters and gliders radio control unit. Very well looked after in immaculate condition. This is a modular radio and can be used with either 35MHz , DSM2 , DSMX and DMSS modules also making it very versatile. Can also be used with 5.8 GHz FPV modules for extended range. Comes with high quality and Precision JR gimbals for accurate control of your models. This sale includes the following: JR X3810 transmitter with 35 MHZ module Operation manual Transmitter battery All sales are final and UK buyers only! Jr transmitter neck strap in used but good condition. Genuine JR/Spektrum Gold Extenal Socket with female Pins, Made in Japan., £5.99 SRP, This is basically a Female to Female JR lead, both ends have the male pins. Fully working JR PCM FM receiver. No crystal fitted. My JR 7 CHANNEL RECEIVER 35MHz. Used to setup a static model never used to fly in model (used for setup only) model sold receiver removed. Jr propo transmitter neck strap in used but good condition.